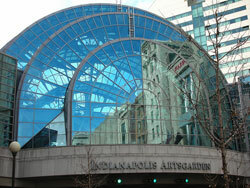 The Indianapolis Artsgarden is located within walking distance of the Marriott, and hosts more than 300 free performances and exhibits each year. The Labs21 2009 Annual Conference took place September 22-24, 2009, at the Indiana Convention Center in Indianapolis, Indiana. For information on how to get around Indianapolis, where to eat, and what to do in Indianapolis, visit the Indianapolis Information page.